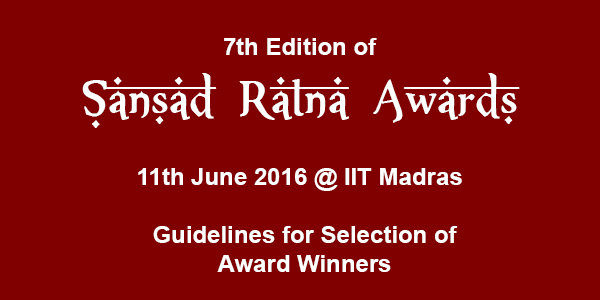 7th Edition of Sansad Ratna Award function will be held on Saturday the 11th June 2016 at IIT Madras. To finalise the guidelines for selection, a meeting of the Judges was held at Delhi. Sansad Ratna Awards Committee Meeting was held at Delhi on 3rd and 4th March 2016. The following Sansad Maha Ratna Awardees of 15th Lok Sabha and presently the judges for the 16th Lok Sabha were present. On behalf of the Sansad Ratna Award Committee the following members were present. Shri Srinivasa Prabhu (Director, Lok Sabha Secretariat) and Shri Kulasekaran (Retd. Director of Lok Sabha Secretariat) were also present. Shri Anand Rao Adsul, Chairman of the Judges Committee chaired the meeting. 1. Srinivasan brought to the notice of the judges that a few MPs were resorting to 'associating' themselves with the matters raised by some other MPs during Zero Hour by simply giving a signed chit to the Speaker. This gave additional point to the MPs without doing the original work. Because of this, the data released by PRS India did not give the real picture. The judges decided that only original works during Zero Hour should be taken into consideration for Awards and all points gained through such 'association' be removed. 2. From 2016, Award winning MPs will be personally informed through confidential mail about their selection. Declaration of Award will be done, only when the MPs personally receive the Award in the function. 3. Performance of Rajya Sabha MPs may also be considered, if a suitable transparent guideline could be formed. There will be 3 categories of Awards viz. General, Women and First Time MPs. 3 MPs will get Award under this category. (c) should have spent a minimum of 50% MPLad fund. (d) Should have secured within the Top 10 performers for overall tally. One top performer among the women MPs on the basis of cumulative total tally (Questions + Private Bills + Debates) every year after the second part of Budget Session. (Subject to the conditions laid in a,b and c above). If a women top performer ranks in the General / First Time MP category, the Committee of Judges will take suitable decision, based on the data at that particular time). 3. One top performer among the First Time MPs on the basis of cumulative total tally (Questions + Private Bills + Debates) every year after the second part of Budget Session. (Subject to the conditions laid in a,b and c above). If a First time MP ranks in the General / Women category, the Committee of Judges will take suitable decision, based on the data at that particular time). (The Committee of Judges will have the right to relax the attendance and MPLad condition, in exceptional cases for genuine reasons, without being quoted as precedent). For Rajya Sabha - The committee is working out the guidelines. It will be announced later. Note: The data relating to 'Debates' category published by PRS India includes the 'association' made by the members during Zero hour matters, without raising the matter. As per the Guidelines for 2016, they are to be removed, to get the original works. PRS India is working on bifurcation of the data. Subject to the availability of correct data, Award winners will be selected for 2016.